Using my OEM windows license in a virtual box image? I just bought a new PC, I'd like to wipe windows and install Ubunutu, but I'd like to be able to run windows in virtual box. Rather than have to buy a totally new window's licence, is it possible to use the license that came with my computer to install window's on a virtual machine. Or is it possible to leave the windows partition and boot that from VirtualBox? As you can tell, I'm a Virtual Box noob. I know the dual boot option, but I'd like to be able to run windows within Ubuntu. 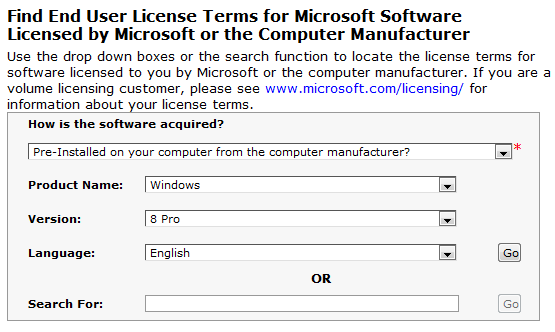 I've stumbled across this question and was curious about Windows 7 Professional (my case). I think EULA (to be found here) answers this conclusively. Below see relevant parts (most notably 3/d). hardware partition or blade is considered to be a separate computer. 3. ADDITIONAL LICENSING REQUIREMENTS AND/ OR USE RIGHTS. I am not a lawyer, but as long as you don't activate multiple copies of Windows (whether physical or virtual) using the same key, it should be fine. So you should be able to wipe Windows, reinstall inside a VM and activate using your key. Remember however that with Windows 8 PCs there is no COA sticker any more, and the key is embedded in the BIOS instead and automatically picked up by the installer. How can I reinstall Windows 7 if I lost my installation DVD? Then I entered the key at the bottom of the computer whose copy of Windows 7 I had overwritten. I did have to go through Microsoft's phone activation system, but this was an automated process for me (i.e., I didn't talk to any actual person). Not the answer you're looking for? Browse other questions tagged windows ubuntu virtualbox or ask your own question. Install Windows 10 from an unbooted OEM drive into Virtualbox? Legally downgrade Windows Vista Home OEM license? Can I use Virtual Box to install windows in a dual boot? Will I be able to burn Win10 install media for a clean install? How do i keep my windows 10 OEM license for later installation?